Many collectors at some point, especially early on in their collecting “careers”, fall prey to the phantom mintmark. What I mean by that is that they see some displaced metal, toning, or shadow that looks like a mintmark where there isn’t one. An example would be seeing a phantom “O” on an 1860 Philadelphia dime and presuming you just got a great deal on a very rare coin. 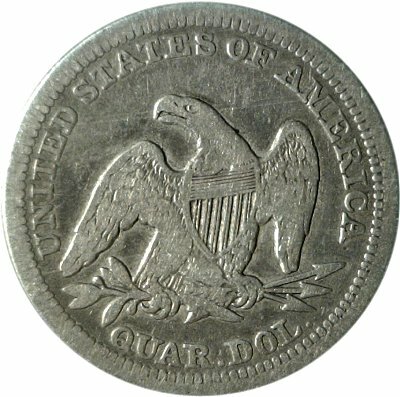 Amongst the seated quarters, the most likely candidates for phantom mintmark mistakes are the 1855-O and the 1860-O, both of which have die pairings and die states with very weak mintmarks and both of which are worth far more than their Philadelphia counterparts; the 1860-O in higher grades and the 1855-O in all grades. At this point I have to confess to purchasing a very nice, original, choice XF 1855 quarter a number of years ago thinking it was an 1855-O with a very weak mintmark. The good news is that I got a really nice coin at a fair price; the bad news being that it was a real 1855 quarter, not the far more rare 1855-O. Then about 3 years ago while trolling EBay I spotted what looked like an 1855-O quarter that had started with a weak mintmark and been cleaned to the point that only a shadow of the mintmark remained. Thinking that I could attribute it using the differences in edge reed counts between Philadelphia and New Orleans quarters, and looking more for a research project than an addition to the collection, I paid $31 for an 1855 (O?) quarter with F15 details and a moderate cleaning. The study of a coin’s third side has been promoted by several numismatists specializing in seated coinage and can yield interesting and valuable information. The definitive work regarding the edge reeding of seated quarters was performed by John McCloskey and published as pages 8 and 9 of Larry Briggs’ Comprehensive Encyclopedia of United States Liberty Seated Quarters. Interestingly, this work began as an effort to authenticate an unusual 1857-S quarter; a coin which turned out to be an 1857 Philadelphia quarter with an S mintmark added by “chasing” metal. The details of the story appeared recently in the Gobrecht Journal (Issue 107 pages 35-39). There are several techniques that can be used for examining the edge of a coin. The most obvious, and most tedious, method is to simply count the reeds. Another technique is to use the mirror from a flashlight, with or without photographing the resulting reflection, to view all of the reeds simultaneously. The simplest process for obtaining a reed comparison, however, is to hold the coin in question between two coins of established origins – in this case an 1855 Philadelphia quarter and an 1855 New Orleans quarter. Obviously, slabbing makes this approach impractical, a fact that is particularly problematic for coins such as the 1855-O which if original, problem free, and/or in high grade is a very valuable coin unlikely to be left raw in today’s coin market. Initial efforts to count reeds on my fine details coin led me to believe that I had been correct and it was indeed an 1855-O quarter. However, the difference in reed count is subtle enough (113 for Philadelphia versus 110 for New Orleans) that I was not 100% convinced and did not have a raw 1855-O to use for side-by-side comparison. Recently, more than two years after my EBay fishing expedition, I acquired a raw VF 1855-O quarter that could be used for comparison. Simply sandwiching the coin in question between an 1855 and my new 1855-O quarter showed unequivocally that it is indeed an 1855-O with most of the O polished off the die and with the remains of the O cleaned off the coin. The photo above shows the reverse of the 1855-O with the O completely missing.